In July the Department of Classics and Ancient History, with a team of postgraduates ably led by Kathryn Thompson, hosted a subject stream at Warwick’s inaugural Sutton Trust Summer School. The event saw nearly one hundred students from all over the country participate across five different subject streams; in addition to Classics, the departments of Law, Politics and International Studies, Economics and Physics also took part. 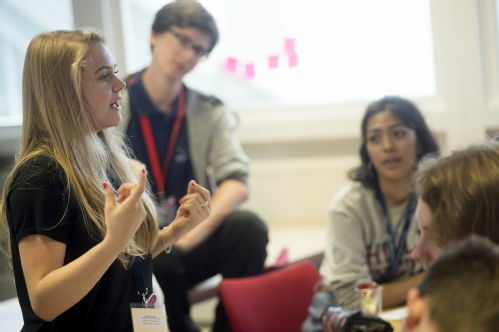 The Summer School was a huge success, with Classics hosting a class of twenty-two pupils – the largest group of all the subjects on offer – for five days of rigorous university-style teaching. 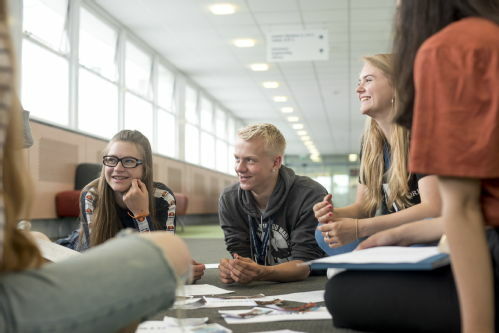 The programme is aimed at bright students from underprivileged backgrounds, who – whilst clearly possessing of the potential – might not consider themselves eligible to progress to university after finishing secondary school. The aim of the week, therefore, is to challenge these students beyond their school syllabus, introducing them to topics, debates and theory they would probably not have been exposed to before, giving them a taste of what it is like to study at university whilst ultimately showing them that they do indeed have what it takes to be successful there. The Classics and Ancient History syllabus was designed to give as broad an introduction to the discipline as possible, illustrating its many facets, whilst homing in on specific areas of research and debate. A wide array of topics was covered, including Numismatics, Literature, Philosophy, Art, and Reception Studies. A typical session incorporated a broad introduction to an area of Classics or Ancient History, and then moved on to a particular aspect of that area, eventually building towards a seminar-type discussion or debate on a specific issue. In this way, the students benefited from breadth and variety whilst simultaneously being able to get stuck in with interrogating more complex sources and tackling thematic issues. Two of the academic sessions – Numismatics and Art – were based around artefact handling, using the Department’s own collection of ancient coins and vases so as to put theory into practice. The young scholars found these sessions really exciting, and the course leaders agreed that they provided the valuable opportunity to teach students how to ‘read’ an object independently and appreciate how it functioned in ancient society. Another highlight was the day trip to the Ashmolean Museum, in which the group participated in four seminar sessions, introducing topics such as Epigraphy and Museology. As part of the trip the group also attended a public lecture given by Professor Alison Cooley on her collaborative ‘Ashmolean Latin Inscriptions Project’. The students said they enjoyed hearing about the “active” side of Classics, in which academics are literally changing the face of museums and the ways in which the public learns from them. Over the course of their week with us the scholars worked on a group project, entitled ‘Venus in the Ancient and Modern Imagination’, in which they investigated the different ways in which the image, meaning and mythology of this goddess has been deployed in an array of different contexts, both ancient and modern. Each group produced an academic research poster to present their findings, accompanied by five-minute presentations given to the rest of the cohort. The results were outstanding, often addressing feminist theory and cultural ideals of beauty, with groups discussing the Roman conceptualisation of motherhood or even deconstructing the ways in which Venus is used by companies such as Gillette in their marketing campaigns. The outcomes of this project illustrated well the continuing relevance of Classics to modern society, as well as its multifaceted nature. Some of the posters are now on display in the Department. We are now looking forward to welcoming a group of Year 9 Sutton Scholars to work with the Ashmolean Latin Inscriptions Project during the spring term 2017, and are eagerly awaiting applications for the next summer school for sixth-formers.